You have the perfect paint and wallpaper on the walls. 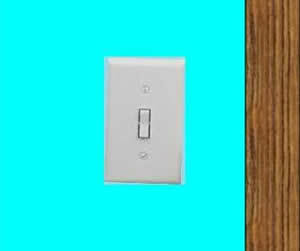 Yet nothing is more frustrating than having a switch or outlet (receptacle) cover plate, sitting on top of that perfectly decorated wall, which is crooked, as shown in Figure 1. This happens in new homes as well as old. This can happen with the standard switches and outlets (receptacles) as well as the decorator style devices. 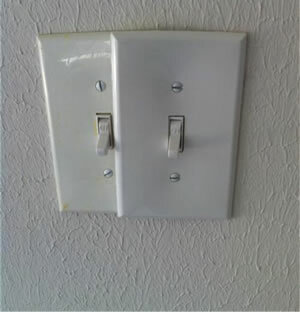 There are many reasons that you can end up with a crooked light switch or outlet (receptacle) plates. However, the primary reason is that the electrician or individual who installed the switch or outlet (receptacle) did not take the time to install the device straight. The situation applies to both vertically and horizontally installed devices. The position of the switch or outlet (receptacle) plate is determined by the position of the switch or outlet (receptacle). There is no horizontal or vertical adjustment within the plate mounting itself. Electrical boxes are seldom installed perfectly straight. This is because many have tabs or other pieces of material that protrude from the top, bottom or sides that prevent the box from being anchored in a perfectly straight position, as shown in Figure 2. This is especially true with the older style metal electrical boxes that are usually designed to be ganged together. As well, in many cases the 2 X 4 wood studs, that the electrical boxes are nailed to, are not perfectly straight. The electrical boxes themselves have the socket that accepts the screw from the switch or outlet (receptacle) mounted exactly in the center of the electrical box and there is no means of adjustment to the left or right. The device manufactures have designed the switches and outlets (receptacles) to have an adjustment within the mounting frame. Each device has an elongated or oval hole, as shown in Figure 3, on the top and bottom of the mounting bracket in order to allow for adjusting the device to a perfectly straight position. One of the problems that occurs, when trying to keep the device straight, is that as you tighten the screws the device wants to move to a crooked position. When tightening the upper screw the top of the device will want to move to the right and when tightening the bottom screw the bottom of the device will want to move to the left. An additional problem that occurs when attempting to straighten switches and/or outlets (receptacles) that have already been installed is that there will be a small indent in the bracket where the screw was previously positioned and tightened. As you tighten the screw, the device will try to return to the original position because of the indent. To maintain the alignment of the switch or outlet (receptacle), it is necessary to hold the device in a straight position while tightening the screws. Then again, some people just don't care how their switch plates look!